The destination wedding is the hottest trend now with many location options available for the newly engaged couples. But when Macau is an option on your list, you don’t need to look further. This former Portuguese colony reflects a perfect combination of mixed cultures – a European feel combined with traditional Chinese and Portuguese influences. Known for its colorful city life, Macau is also called the “Las Vegas of Asia”. In recent years, Macau has emerged as a popular location for destination weddings as it offers many options for venues. Whether you want a stunning wedding in a lavish resort, or want to tie the knot in a rooftop ceremony on a skyscraper, Macau has everything to offer. From beaches to skyscrapers and historical buildings, Macau has the charm that you might be looking for in the venue for your big fat Indian wedding. Macau has no shortage of picturesque views that you can choose to be the venue for your big day. For those who like European style, there are many historical churches and buildings with the Portuguese influence, perfectly creating the European atmosphere. The result is an ideal backdrop for your wedding and lots of Instagram worthy photo opportunities. And the options don’t end just there. Citadels, temples, beaches, gardens, and fortress are there in Macau, effectively increasing your options to choose from for your destination wedding. These exotic venues have the appeal and stunning beauty to make your wedding grand. These venues will spark your imagination with their exquisiteness, leading you to enjoy your fairytale wedding with your loved ones present to witness your big day. And if you want to mix things up a bit then go for different locations for your pre-wedding photo shoot and wedding ceremony. The city’s Portuguese history has resulted in many beautiful architectural buildings and views that are perfect for a pre-wedding photo shoot. You can choose a European setting (Macau has many of those) for the pre-wedding photo shoot with a more traditional approach for the wedding. Since Macau is a popular tourist destination, there are many resorts and five-star hotels that offer special packages for destination weddings. Here, you can get the wedding of your dreams, with every little detail designed to match your wishes. A well-planned event or changes in the last minute, the staff at these resorts and hotels is always ready to cater to all your needs and to make your big day wonderful for you, your significant other, and your guests. From custom decorations to personalized invites, you can check every option on your checklist. 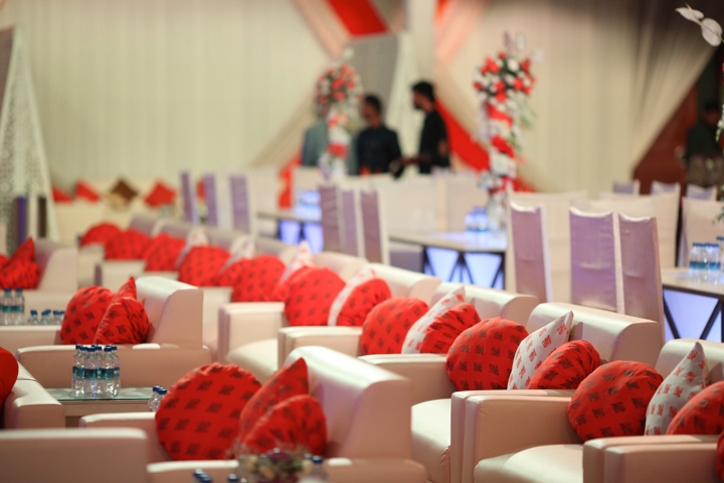 The whole event will leave you with unforgettable memories and happy guests. Therefore, tying the knot in Macau will be one of the best decisions that you will ever make. Wedding in this beautiful city will be both exclusive and exotic providing you with a memorable experience. Now all you need is a destination wedding expert to arrange everything ranging from photographers to musicians and resort. Contact Rachnoutsav Weddings to have the perfect wedding arranged for you in Macau. Get the perfect blend of tradition and modern style in your big fat Indian wedding.